We would not want gliese 710, to disrupt our ice belt. When finally our star expands we would want earth further away from it. A possible resolution to each being moving these objects. Is one of the objectives of milkyway@home to determine where are likely places for signals from space to come from? Message 63099 - Posted: 4 Feb 2015, 4:41:57 UTC - in response to Message 63098. No that is the Seti@home project. This project is to map the universe. Message 63100 - Posted: 4 Feb 2015, 15:19:06 UTC - in response to Message 63099. 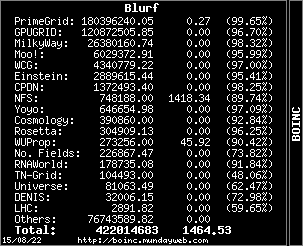 Thank you, I am certainly going to look it up and add it to my BOINC roster.